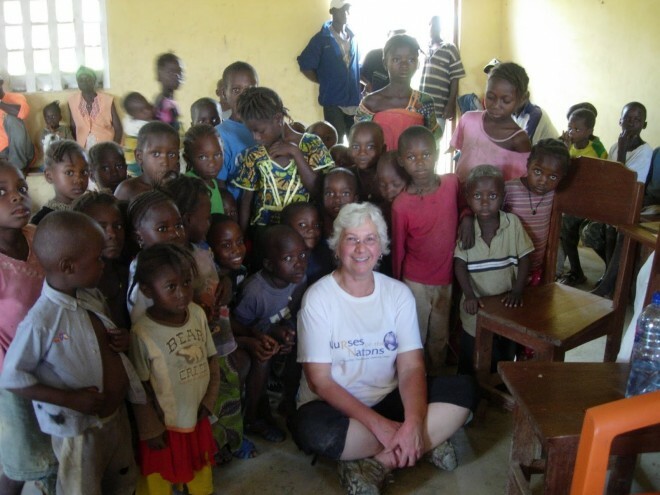 Caring for the poorest of the poor in West Africa. Liza: I’m attaching a photo of me taken during a recent nursing mission trip to Liberia, West Africa with a group called Nurses for the Nations. Hundreds of people traveled on foot for days and even slept on the concrete floor of this church in order to receive some basic nursing care. The kids were the best! This photo was actually taken in the country of Guinea. We had to travel over the border from Liberia to Guinea by motorcycle because the roads were too muddy to naviagte by truck. There was no running water or electricity in any of the villages we visited. It was a pretty challenging environment in which to practice. Thank you, Sonia. This has been corrected. I apologize for the error.